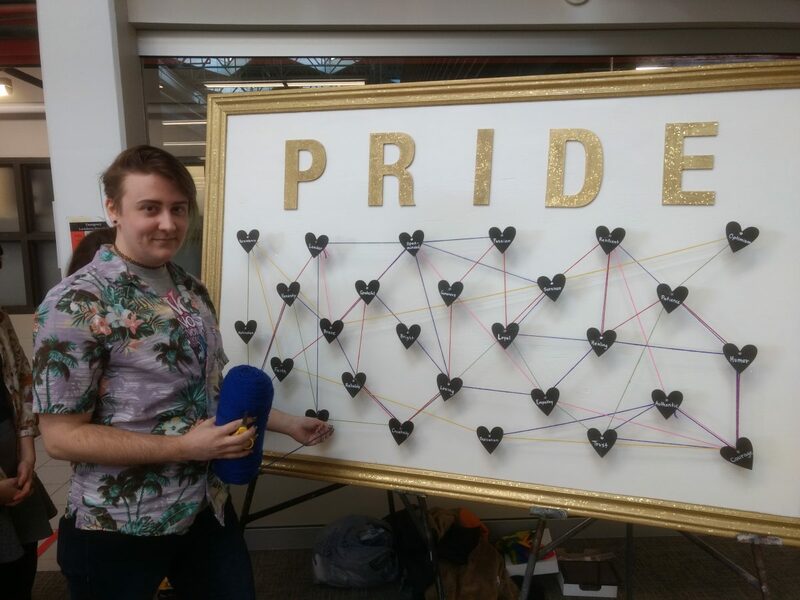 It’s Pride Week at Sheridan College, which means that colorful displays, events and presentations across the Davis, HMC and Trafalgar campuses from April first until April fifth. The theme of this year’s Pride Week is focusing on breaking down barriers, with an emphasis on exploring what forms people’s identities and what kinds of barriers they might or are facing in the community. “I think Pride Week brings this sense of building a community with like-minded people even if they seem different. It’s cool how it brings us together so people better understand and we can remove the awkwardness of talking about these sorts of things,” said Holly Thomas, an illustration student at Sheridan Trafalgar Campus. All throughout the week, the community will be holding a cupcake fundraiser table, every day at every campus. Heartstrings: Community in Colour, was an interactive art display held in Trafalgar’s Learning Commons on Monday, hosted by Cory Haslett. “We’ve done Pride Week at the SSU for the past three years, during the first week of April. The idea stemmed from the fact that while the region celebrates Pride during June, most of our students aren’t present during the summer semester. So, having a Pride Week during the winter semester allows more students to be engaged with it. And this year we’re really excited that we were able to partner with more Sheridan departments, as well as the Building Positive Space Committee, to make it a more involved event from a number of groups besides the student union.” Haslett is Trafalgar Campus’s vice president for the SSU, and is President of Sheridan’s LGBTQ community club. Haslett has been the SSU’s main hand in helping to plan and coordinate the events and presentations of Pride Week. The Building Positive Space Committee has 10 departments, six of which are directly assisting with Pride Week events. Later today, The Marquee will be holding a special Monday Dip’s and Flix in honour of Pride Week. Love Simon will be screened at the campus pub at 6 p.m. The LGBTQ community extends to many cultures and peoples present at the college, including the Indigenous peoples. In aboriginal culture, people who are gay or transgender are considered two-spirited. This is why Sheridan’s Centre for Indigenous Learning and Support is holding the Two Spirit Teachings on Tuesday from 2 p.m. to 3:30 p.m. The talk is aimed at providing information about the LGBTQ in indigenous communities, as well as hearing stories from speakers about their experiences. Most notably Stephanie Stephens, a consultant at the Indigenous office, will be hosting the event. “I am Two Spirited, Anishinaabe working at Sheridan College. I will be hosting an informal discussion focusing on the history of the Two Spirit concept, and some historical understandings of Two Spirited people. Some of the Indigenous traditional customs and protocols conflict with Two Spirit identities today and I have experience navigating the traditional culture in contemporary times, unsettling status quo and dispelling myths,” said Stephens. 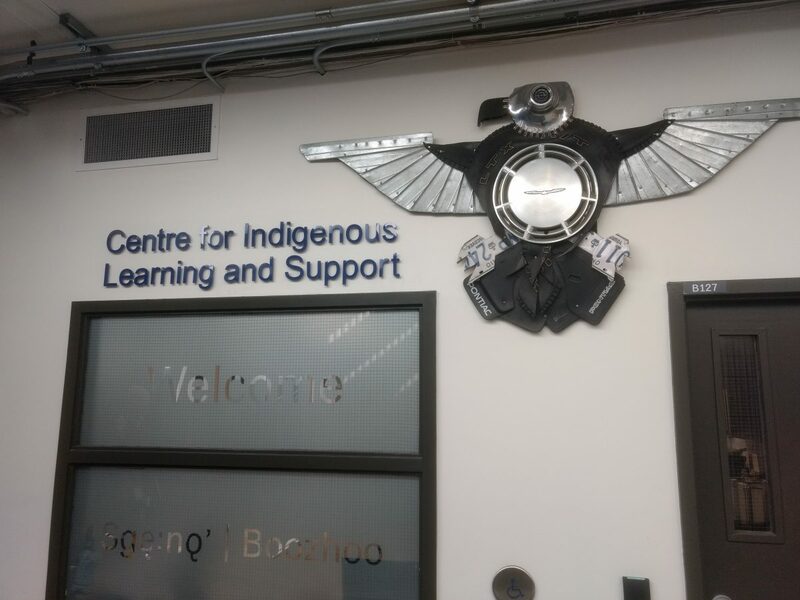 Sheridan’s Centre for Indigenous Learning and Support provides support and information to all students interested on the topic. On Wednesday at 1 p.m., Sheridan theatre students will be performing a musical called Prom Queen at Trafalgar, while at HMC, the Unbiased club will be hosting the Gaymes Night from 6:30-8:30 p.m.
Events on Thursday and Friday will be especially fun, with The Marquee holding the Pride Prom Pub Night, a documentary screening and an arts and crafts event to finish. “For a lot of LGBTQ community members, there’s still a lack of structural resources at the college, as is the case for the surrounding region as well. These resources are often underfunded but sorely needed. While society and Sheridan has made a lot of progress in supporting the members of the community, there is still a great need for more support, and having this week not only brings attention to the affirmations of that community within our space, but also allows this opportunity for people to be openly, expressly themselves and to engage in dialogue that continues for the rest of the year,” said Haslett.